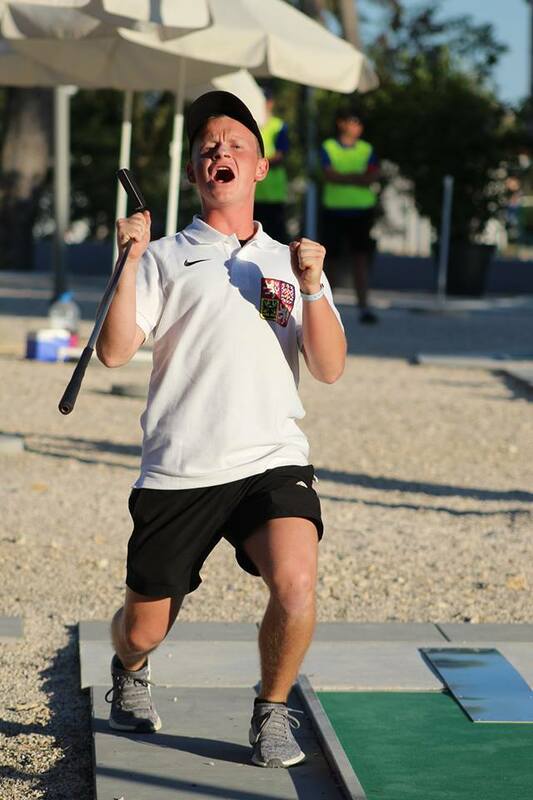 In part 3 our series of re-posts of the youth interviews from the WMF Youth Facebook page, we have an interview with Ondřej �kaloud from the Czech Republic. He was a double silver medalist in the 2017 World Championships and knows how to bring emotion to the course! In case you missed the second in the series, you can catch it here. The following interview can also be found here. OS: I started to play minigolf when I was 4 years old in 2002 when my brother V�t �kaloud won the public tournament in Rakovn�k. I played there as well, ended as the last one, but still received a trophy for the youngest competitor. Since then my whole family, including me, grew a passion for minigolf. I played my first international tournament in 2012, two years after the end of my brother's career (he stopped playing in 2010 after YWC in Sochi). Q2: Tell us some more about the club you first represented. What have they meant for you? OS: My first step was logical - I became part of a team from GC 85 Rakovn�k (I also lived there at that time) and I owe them a lot for my whole childhood which was really full of the minigolf experience. They helped me a lot to grow as a person and as a player and therefore I was really sad when I left them this year for MGC Olomouc. Q3: What is your favourite ball? OS: My favourite ball is Deutschmann 85 (slower silver edition) which is really the most beautiful ball in the world and I take care of it like it is my baby. Q4: What surface do you prefer the most? OS: I consider miniature as my favourite because it was the most common for me during the first minigolf years and since I do not prefer to play faster shots. Until I became the best player on felt during the WC in Zaton, felt used to be my least favourite. But there is a realistic chance that I will grow more positive attitude to felt in future after all. OS: I did not look up to some ideal players until I was 10 years old but since I started to play with my brother, he was the first one I had great respect for. I also consider as the most admirable person to be Walter Erlbruch who devoted his whole life to minigolf. His minigolf thinking as well as his top minigolf career is really wonderful. He is the greatest player ever for me. OS: I hope the biggest merit will be in my minigolf future. OS: My greatest and most valuable memory comes from the last team round on YEC in Ostrava 2015 when I was finishing my round on 18 knowing about our team gold medal. My teammates were waiting for my last shot and then to share such a happy experience with 6 other players was just amazing. I really like to recall these feelings but still cannot leave individual achievements on YWC, YEC and all the medals reached while playing in general class behind. Especially the silver medal from last year - the battle with Walter Erlbruch and then Fredrik Persson will stay in my memory forever. I would like to end by mentioning one more moment when I actually did not have to play, but I could only watch when Alena Dole�elov� won the silver medal on YEC in Askim. It is probably the greatest and nicest moment in my minigolf life/career I have ever experienced. OS: I cannot imagine my life without all friends I have met (from all over the world) playing minigolf. Like a big second family for me.